PATEK PHILIPPE REF. 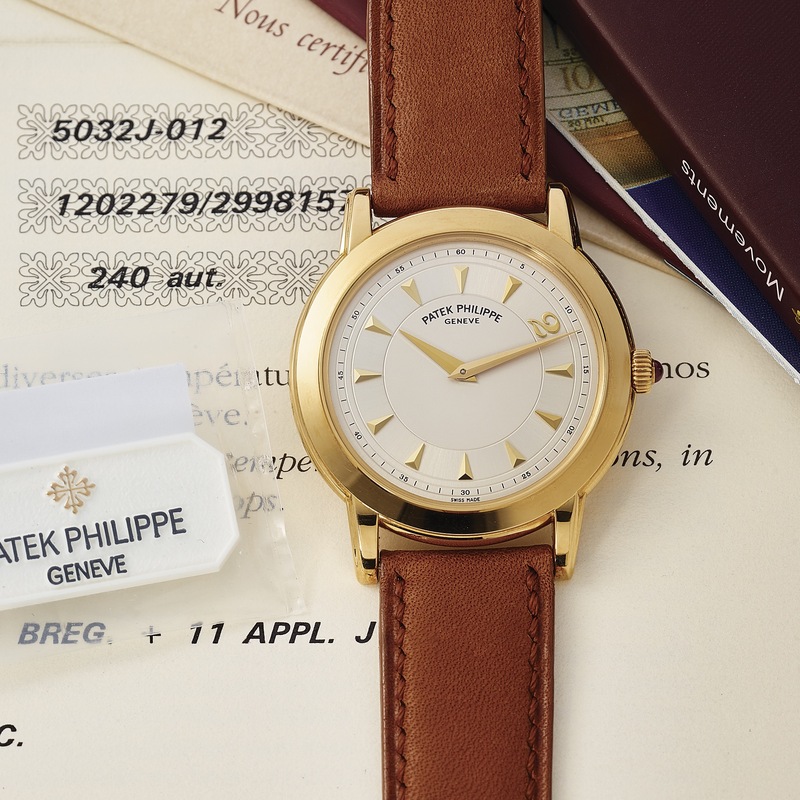 5032 MILLENNIUM YELLOW GOLD Patek Philippe, Genève, Millennium, No. 64 / 100, No. 1202279, case No. 2998157, Ref. 5032J. Made in a limited edition of 100 pieces to commemorate the year 2000. Very fine and rare, elegant, self-winding, water-resistant, 18K yellow gold wristwatch with an 18K yellow gold Patek Philippe buckle. Accompanied by the Attestation, booklet and Certificate of Origin within a leather wallet. Two-body, solid, polished, fluted lugs, screwed-down case back engraved with the Patek Philippe Factory in Geneva, cabochon ruby-set winding-crown, domed sapphire crystal. Two-tone silver with applied yellow gold dart indexes and a Breguet "2" numeral at 2 o`clock on an outer plain reserve, outer minute track with 5-minute Arabic markers. Yellow gold dauphine hands. Cal. 240, stamped with the Seal of Geneva quality mark, rhodium-plated, fausses côtes decoration, 27 jewels, straight- line lever escapement, Gyromax balance adjusted for heat, cold, isochronism and 5 positions, shock absorber, free-sprung self-compensating balance spring. C. Two-body, solid, polished, fluted lugs, screwed-down case back engraved with the Patek Philippe Factory in Geneva, cabochon ruby-set winding-crown, domed sapphire crystal. D. Two-tone silver with applied yellow gold dart indexes and a Breguet "2" numeral at 2 o`clock on an outer plain reserve, outer minute track with 5-minute Arabic markers. Yellow gold dauphine hands. M. Cal. 240, stamped with the Seal of Geneva quality mark, rhodium-plated, fausses côtes decoration, 27 jewels, straight- line lever escapement, Gyromax balance adjusted for heat, cold, isochronism and 5 positions, shock absorber, free-sprung self-compensating balance spring. Dial, case and movement signed. DIAM. 36 mm. THICKNESS 7 mm.